New figures show the US economy expanded by 3% in the three months to the end of June, growing at its fastest pace in more than two years. 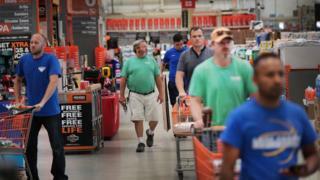 Consumer and business spending was higher than previously estimated, the US Bureau of Economic Analysis said. The revision lifted the annual GDP growth rate from the earlier 2.6% estimate, with growth accelerating from a slow start to the year. But economists said it did not alter the picture significantly. On a year-on-year basis, GDP increased by 2.2% in the second quarter - similar to the "stolid" growth that has characterised the US economy in recent years, said Gus Faucher, chief economist for PNC Bank, based in Pittsburgh. "The economy today with this number looks a lot like the economy yesterday," he told the BBC. The 3% growth rate in the second quarter marked a rebound from 1.2% growth in the first three months of the year. The Bureau of Economic Analysis (BEA) said consumers spent more than previously estimated on items such as housing and utilities, while businesses invested in categories such as equipment and intellectual property. The improvement could help make the case for the Federal Reserve to move forward with plans to raise interest rates and wind down the portfolio of securities and other assets it acquired as part of a prior stimulus programme. Analysts currently expect an announcement about the balance sheet in September and a rate hike in December. US President Donald Trump has said he wants to see the US economy increase by 3% for 2017. Wednesday's revision shows that US economy has momentum going into the second half of the year, but Mr Faucher said he did not expect that rate to be sustained over the full year. GDP increased by about 1.5% in 2016 in the US and by 2.9% in 2015, according to the BEA.